Rich malt aroma with solid chocolate notes. Some light-roasted bitterness with a touch of fruit is evident. Finishes smoothly, its potion alcohol well hidden in its creamy body. Today we are drinking two beers. Why? No idea. But who cares… it’s beer! 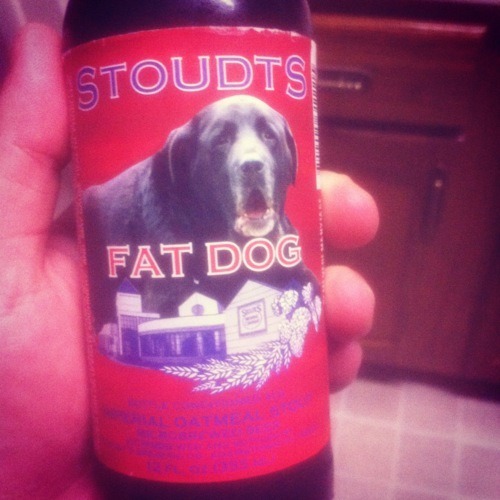 The first beer we are drinking today is a Fat Dog stout from Stoudt’s Brewing Company. The label is awesome; the dog is so cute. There really is a fat dog! Anyway, this beer has a HUGE ABV, coming in at 9%. The beer is actually an imperial oatmeal stout, and I am not normally a big fan of an imperial stout. Let’s see what this one has in store. In the Glass: In the glass, it’s dark. It almost looks like a cola. The head is actually pretty similar to that of a soda too. It’s light, with not much definition. You can’t see through the glass, but the beer doesn’t look thick. Let’s see what it smells like. Nose: The nose is soft and subtle, and has a certain sweetness to it. Some of the oatmeal stouts that I have had don’t really smell like a stout. Now this one smells like a stout. I wonder what it tastes like. Flavor: The flavor in this beer is HUGE. Oh man, it’s so good. The sweetness is pretty obvious and there is a ton of carbonation on the back of the palate as the beer slides down your throat. It isn’t think at all, and doesn’t really taste like a stout. It has a much smoother flavor than you would expect from a beer like this. Mouthfeel: The mouthfeel is amazing. It’s starts without much, then the carbonation comes in. Then, as the beer slides down you get that overwhelming stout flavor. The beer just continues to impress one sip after another. And the thing is, the high ABV isn’t obvious. You don’t notice it at all really. Oh man, I like this beer! Aftertaste: The aftertaste is long and dry and leaves that obvious stout aftertaste. I say obvious, when a Guinness has no aftertaste at all. But this is what a stout is supposed to be. I had no idea what to expect when pouring this into the glass, but I was impressed. I would totally order another one of these. This beer is DELICIOUS! Bottoms up people. Today we are tasting a stout. Yay! I love stouts. And porters. As I’ve mentioned before, my favorite beer is a porter. But I’m also kind of picky about which ones I really like, so we’ll see if I end up liking this one or not. The beer is very dark and thick. You can’t see through the glass. It doesn’t really have a lot of head. It also doesn’t have a lot of scent to it. It smells like a stout, but nothing really overly jumps out at you other than that. It just smells wet. Let’s see if it tastes any better. It does tastes better than it smells. Has kind of a chocolaty, almost soda kind of taste to it. Yeah, I said soda. It’s a little bit carbonated. The chocolaty taste is definitely there though. I like it, but it’s not overly great to me. Probably wouldn’t be my first choice in stouts, but it’s not bad. I would probably buy it again if there weren’t other options available that I prefer more. It is, however, a good winter beer, one that’s worth checking out.